In the 50’s, 60’s and even 70’s owning a Cadillac meant something of excellent craftsmanship and quality. While Cadillac wasn’t designed to be a performance driven product, owning one brought about one’s success and class status in society. These pass couple of decades had quite the opposite effect; Cadillac lost that art of its craftsmanship and ownership. With the new generation ATS and rejuvenated CTS, Cadillac is bringing back the quality and inventive dexterity to their products. This all new CTS Vsport is starting to show up its German competition, and is ready to take back its title and its consumers. Cadillac had a rough road ahead creating the perfect luxury, performance sedan; a hard road that will start paying dividends in the end. To be a proper Cadillac it must be poise, sophisticated, and flashy but not ‘show-offy’. The CTS hits the mark perfectly. The body style is subtle and handsome. It has a masculine appeal. The LED daytime running ‘Teardrop” lights are elegant and catches many motorist attention. The CTS holds a composed balance of architecture in its profile with its streamline design and as it finishes off at the rear, we are left with a sophisticated, classy touch of LED tail taillights that look absolutely superb. Cadillac uses an elusive amount of chrome to accent its details like the large grille and dual intrigued exhaust system. Our sampled CTS came with attractive 18” Midnight Silver Premium wheels – against our optional Red Obsession Tintcoat paint, the CTS starts to show off its sporty side… hence the ‘V’ badge on the trunk. But this is no longer your Grandfather’s Caddy. When the Chief Engineer, Dave Leone uses grams in lieu of pounds to construct the CTS, you get the sense that their main focus was to beat out their German rivals. To give you an idea of what they’re on about, the top trimmed spec CTS Vsport with a Panoramic Sunroof weights 450lbs less than a BMW 550i. That’s practically a Mini Cooper… give or take a pound. And that’s just the start. The architecture behind the body is a combination of aluminum and magnesium verses the traditional steel. The B-pillar is designed using a single “tailor-rolled” steel blank verses multiple parts glued together. And to remove nearly ½ a pound (3000 grams) they trimmed the stamping flanges to remove any unneeded material between welds. This is a sign of an all new generation from Cadillac. All that weight shedding starts to pay off for what’s underneath. Traditionally, the stamped ‘V’ on the back meant a Corvette V-8 under the hood. This time around, they placed a 420 horsepower 3.6-liter Twin Turbo V-6 maniac. Connected to the rear wheels, and an 8-speed automatic transmission, the CTS will lay down a set of treads to 60 mph in 4.4 seconds. If you can manage keeping your foot down, you can reach its top speed of 172 mph. Driving the CTS is unlike any usual American luxury sedan. It’s an absolute peach to drive. You get 4 driving modes to choose from: Tour (Eco/Comfort), Sport, Track, and Snow/Ice. Each designed to fit your mood for the day. Under Tour, the CTS is a comfortable, smooth riding sedan. The ride quality is superb with a magnetic ride control, road noise is unnoticeable and maneuverability is light and breezy. If you opt for Sport or Track, the CTS becomes a whole different machine. Using the Magnesium Paddle shifters the transmission changes its shift points and holds its gears longer. Downshifting and upshifting are instantaneous for a quicker exit out of turns. Acceleration is so quick; you’ll forget that you left the traction control on. And when it shifts at 6,000 rpms, you get a small blip from the exhaust. The drivability on the CTS is absolutely fantastic! The chassis is eccentric; every corner taken will be flat and smooth. The handling becomes much more aggressive and agile. And with the large Brembo brake package, the stopping distance from 70 mph is less than 150 feet – that’s pretty darn quick. 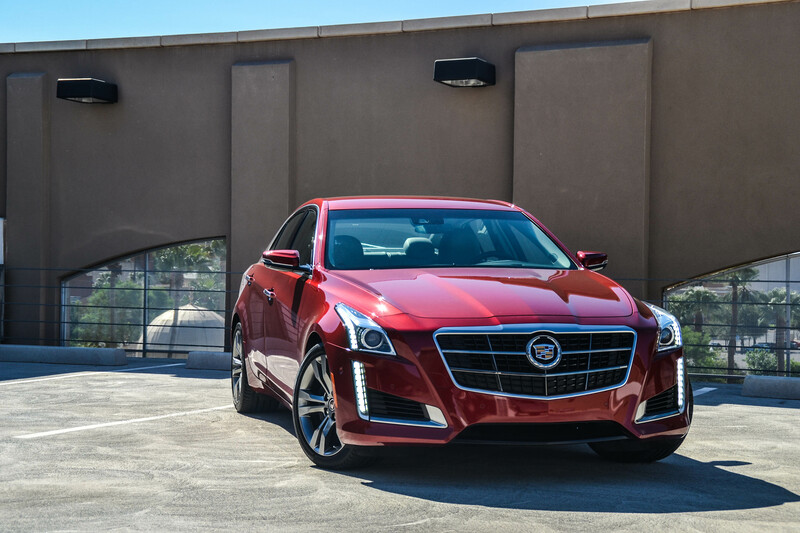 Every time you get behind the wheel of the CTS, you’ll never be disappointed. Once you pass the Cadillac embossed stainless steel threshold, you are cushioned with a gorgeous leather interior. The interior incorporates an excellent use of high gloss wood and dark chrome trim throughout. The two-tone dash is handsome and elegant with a flowing design. And the ambient light throughout is very subtle and delightful. Our sampled CTS Vsport was beyond well equipped. The driver and front passenger will be cocooned in comfort through the 8-way power adjustable seats with heated and ventilated features. Rear passengers will enjoy a comfortable back seat with high thigh position and plenty of leg and headroom. The driver’s seat, however is the place to be; the thick leather wrapped power adjustable steering wheel is comfortable to the hands – the steering wheel is heated for cold winter days and the multi-function controls are well laid out for easy access. Cadillac used space age technology and design when it came to their infotainment infrastructure. In lieu of buttons, everything is touch sensitive; which isn’t exactly user friendly; it does take time to learn and get used to. The same goes for the touch sensitive, power operated cup holder hide-away, and storage cubby behind the climate control system. The 5.7” touch screen display with Cadillac CUE requires a much needed learning curve. It can be difficult to use and operate; and finding the right setting can get you lost and very confused. We were also very disappointed in the rear view camera display; it shows dated quality being very pixilated. With any car, there are dislikes to be had – for the CTS there wasn’t many. We thought the side wing mirrors where too small, the front parking sensors would sporadically go off when at a dead stop and even with our 19 gallon fuel tank, the CTS eats its fuel faster than we could fill it up while barely averaging 15 mpg in the city. If Cadillac could bring back some of the button concept to the dash and fix that CUE system; the CTS would be darn near close to being the perfect luxury sedan. Holy crap. These pictures are gorgeous!! Thank you! It was a rough day trying to find a spot to shoot it. What I hate the most in Caddies is that glossy piano console. It drives me nuts. Its definitely not an attractive piece and shows all the nasty dust bites and fingerprints. But by how well this car drives and performs, its easily something we can overlook.